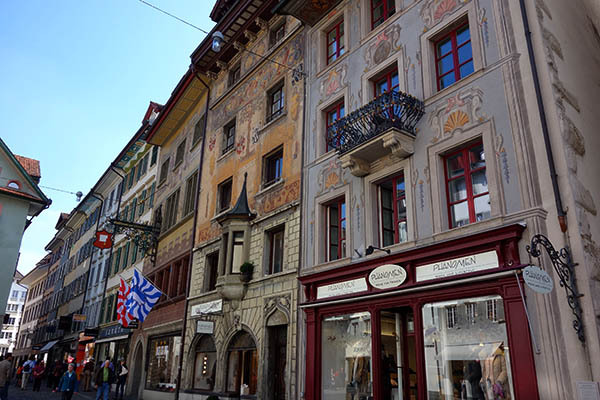 My last weekend in Switzerland, I visisted Luzern, a small city not far from Zurich. 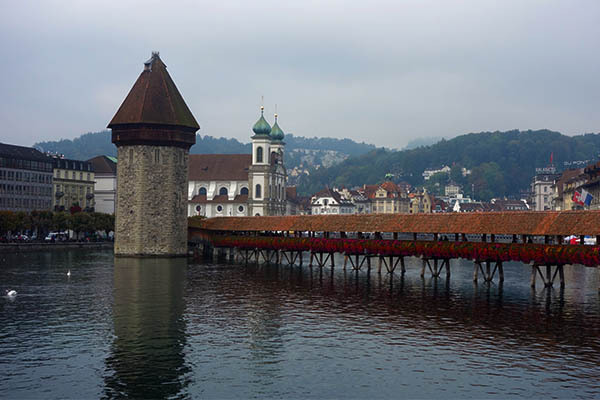 You see this city in a ton of photos of Switzerland, primarily because of its medieval wooden bridges. I wasn’t sure what to expect, but it looked pretty. I arrived Friday evening and took a walk through downtown before heading to my AirBnB. It was quite a struggle, actually, the toughest AirBnB for me to get into. I had no wifi and no phone, yet I was staying in a large apartment building. No doorman: just two locked doors. One on the front, and one around the corner by parking. It was unclear what door to use. It was a puzzle: how to contact my host. Luckily I found a bar nearby and after some more struggles managed to find wifi so I could message the host. 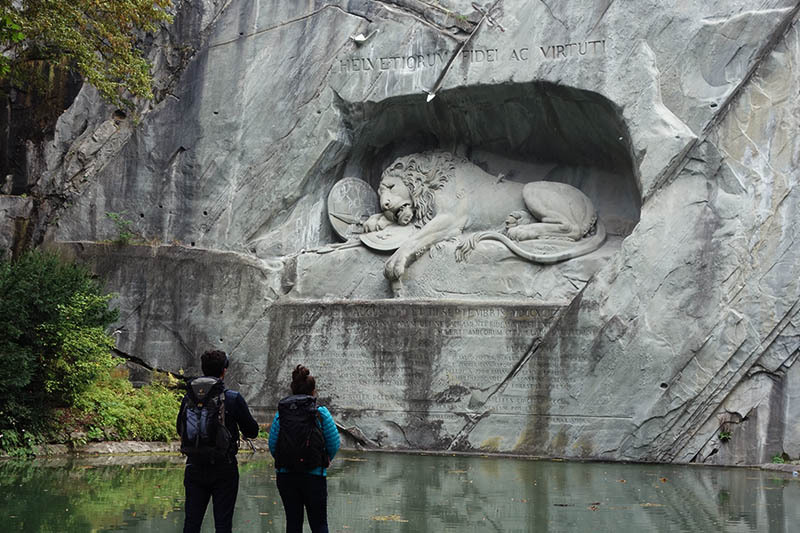 It’s a remarkable work of art, carved into the side of a cliff above a small pond, in a little city garden. The statue and the pond overwhelm the garden. While I was there, a large tour group arrived. The area around the park is gift shops and pricey looking restaurants. The Bourbaki Panorama is around the corner. It commemorates the forgotten Franco-Prussian war (I decided to skip this). The classic Church of Saint Leodegar is a few minute’s walk away. 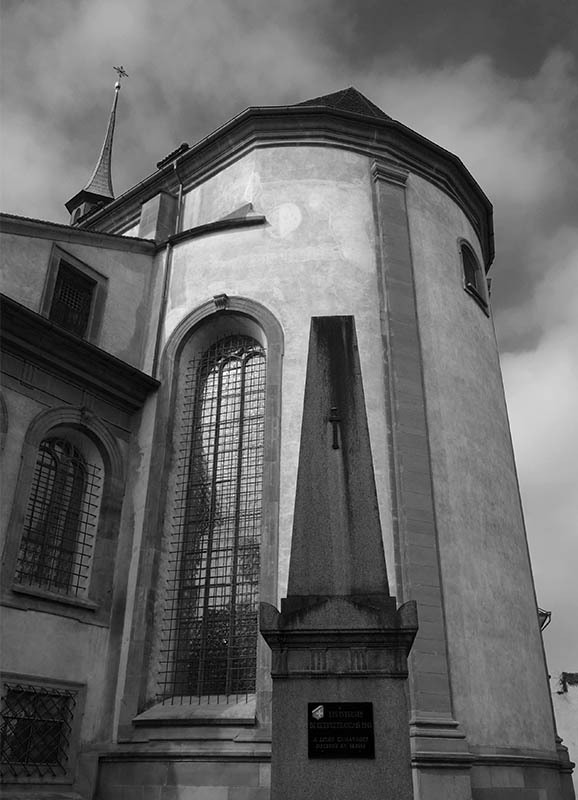 It’s as stereotypical a Swiss church as you can imagine, and the only such church I saw in Switzerland. But my favorite experience in the city was visiting the city walls. I didn’t realize they were accessible: they’re tucked out of the tourist track. Although they loom over the city, people must not want to make the walk. I stumbled onto them, myself. The walls are medieval and set on hills near the city. There are a bunch of parks nearby – kids playing soccer, and few tourists. 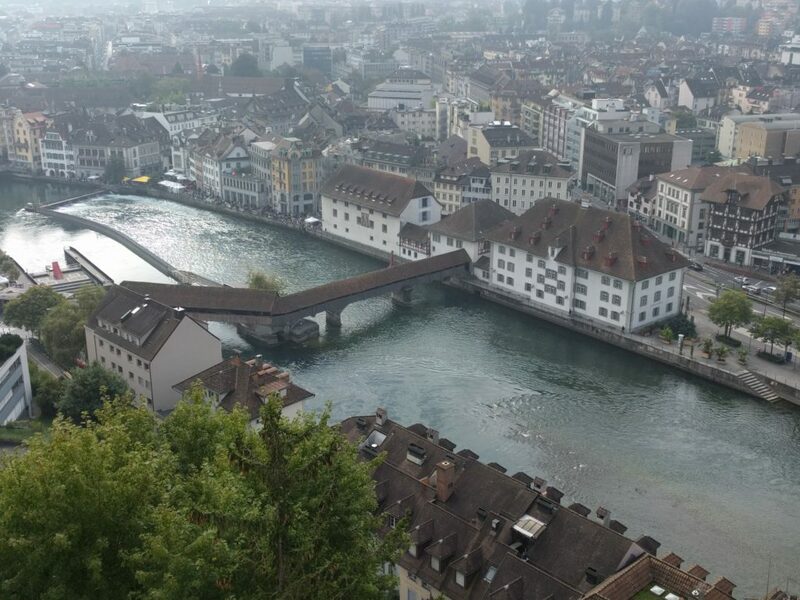 The view from on top was spectacular, from the air Luzern is still a medieval city. For a while I had them to myself, and it was wonderful. Very calm! I decided, later than I should have, to go for a hike. 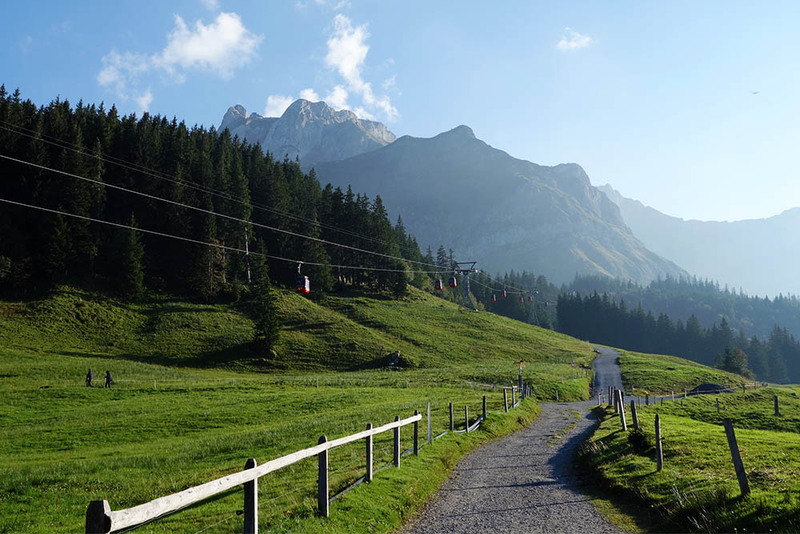 Before I arrived in Switzerland, I ached to go for a hike in the Alps – how often do you have that opportunity? But in the morning I wasn’t in the mood. Now, though, it seemed a shame to leave Switzerland without seeing the Alps it arms-length. 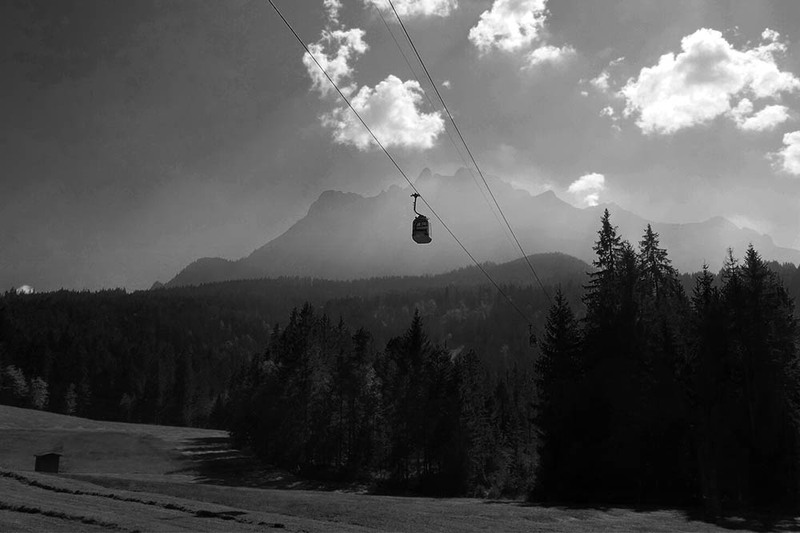 There are a several popular mountains near Luzern. 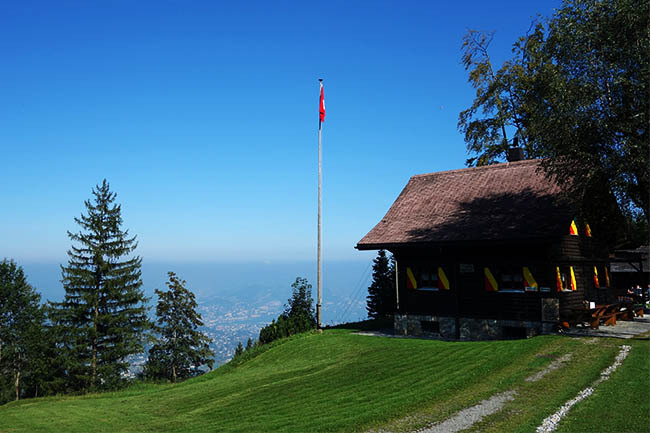 I did some research before arriving and settled on Mt Pilatus as the simplest destination. 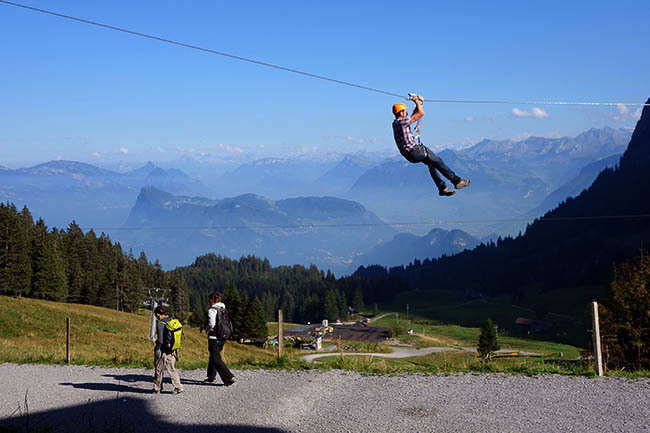 It offers a variety of trails and cable cars all the way to the top. There’s even a hotel up there. 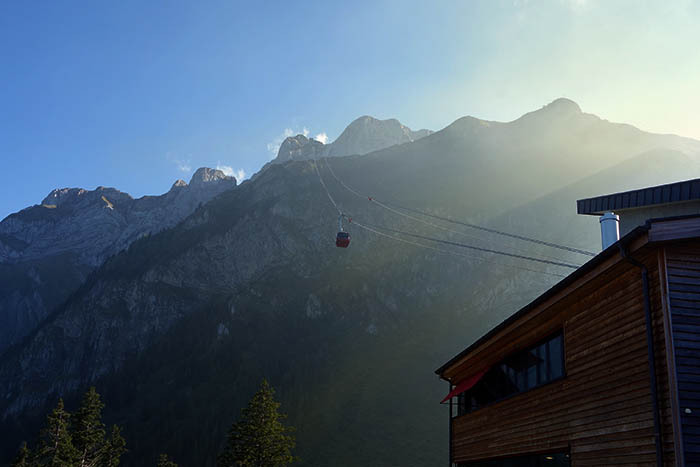 With my late start I also decided not to worry about the cable cars or anything – a very expensive proposition. Anyway, I prefer hiking on foot. Thing is, it was a daunting challenge. I felt out-of-shape as I hiked, even a few steps in. But my mood picked up with the altitude, and I felt my blood flowing again. Anyway, I could always turn back. Hikers who passed, all struck me as very Germanic, were friendly to a fellow soul. As I got higher there were some nice views of the city below. But I wasn’t even midway when I reached a cable car stop (there are stages up the mountain), and drenched in sweat. I considered turning back, but a co-worker had said there was a nice meadow near this stop. With the prospect of flat ground, I continued a bit further and BAM! there was a tremendous view of the mountain. It sprang into sight. I didn’t expect it all. Well, I couldn’t turn back then. Slogging further up the mountain, I found some cozy ski lodges. I guess people can drive up with jeeps, but these felt solitary in that mountainous landscape. The view here started to open up with more Alpine meadows. By now it was starting to get late – it was 4 in the afternoon and the sun was dipping. My earlier burst of energy dissipated and I wanted to sit down. I’d hiked, about 7 miles, and with several thousand feet of elevation gain. Luckily, I rolled into the final cable car stop before the top. Here I considered paying to see the view from on top. But, I was proud of the work I’d done hiking this far. Around tee corner from the cable car was a little sled run with people going down tracks on sleds. They were selling cans of beer here, so I kicked back with one, some snacks I’d brought, and enjoyed the view. Was it only the cold mountain air, or was this another world? I know I was close to the city, but an incredible panorama lay in front of me. This marked the end of my trip. I’d walk back down the mountain into the evening. The next day, I’d return to Zurich, see the city in daylight for a few hours, and then fly home. I had a great time in Switzerland. Luzern was pretty, Zurich underappreciated, but Bern was my favorite place. If (When!) I return, it’ll be to see more of the Alps, which are a gem I want to enjoy more in the future. This entry was posted in Switzerland on June 4, 2017 by rob.